[March 23, 2017] LINCOLN - The Lincoln Elks #914 Lodge in cooperation with the Illinois Elks Children’s Care Corporation and Abraham Lincoln Memorial Hospital will once again sponsor a free children’s orthopedic assessment clinic on Tuesday April 4 from 1pm to 3:00pm at ALMH. David Purves, PA-C, ATC of the Springfield Clinic Orthopedic Group will conduct the assessments. The clinic is by appointment only. The clinic is an ideal time to have a child reviewed for bone and joint development. If your child has an uncorrectable deformity, complains of back, knee, leg, ankle pain or has a back curvature, they can be seen at the clinic. No medical referral is necessary for the clinic, however, physicians are welcome to refer patients to the clinic for a specific reason or second opinion. The Elks Organization has been working with physically challenged children since 1928. There are 17 clinic locations throughout Illinois. The Elks will provide financial assistance to the best of their ability for children needing further treatment or specialty equipment when the family lacks sufficient resources to do so. In the past, the Elks have purchased therapy services, corrective shoes, braces, orthotics, wheelchairs and augmentative communication devices to help children overcome a variety of physical challenges. 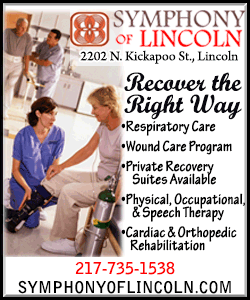 Abraham Lincoln Memorial Hospital is located at 200 Stahlhut in Lincoln, IL. To make an appointment for the clinic, call the Illinois Elks Children’s Care office at 1-800-272-0074 anytime between 9am - 4pm, Monday through Friday. There are no charges for any services performed at the clinic.